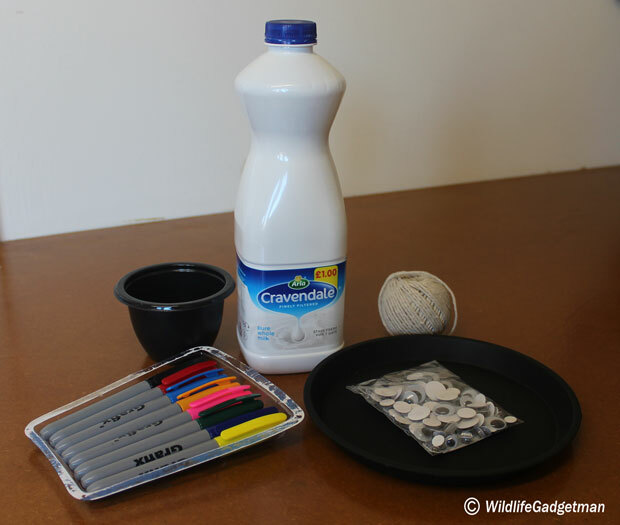 What you Need: (x1) Empty Cravendale plastic milk bottle (or similar), (x1) small plastic plant drip tray, a small plastic pudding tub, stick on googly eyes (optional), permanent marker pens, black insulating tape. Winter is fast approaching and it won’t be long before we see the first snow flurries. Before you know it we’ll be putting up Christmas decorations and wrapping presents. 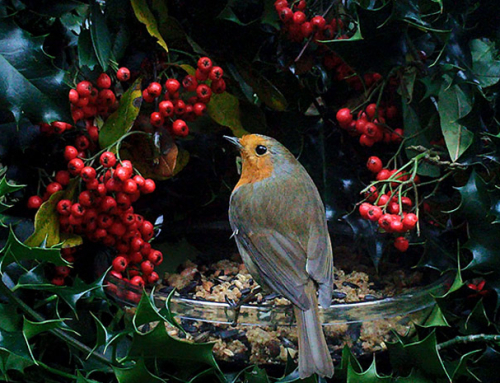 Why not have a go at making a festive present for your garden birds too! 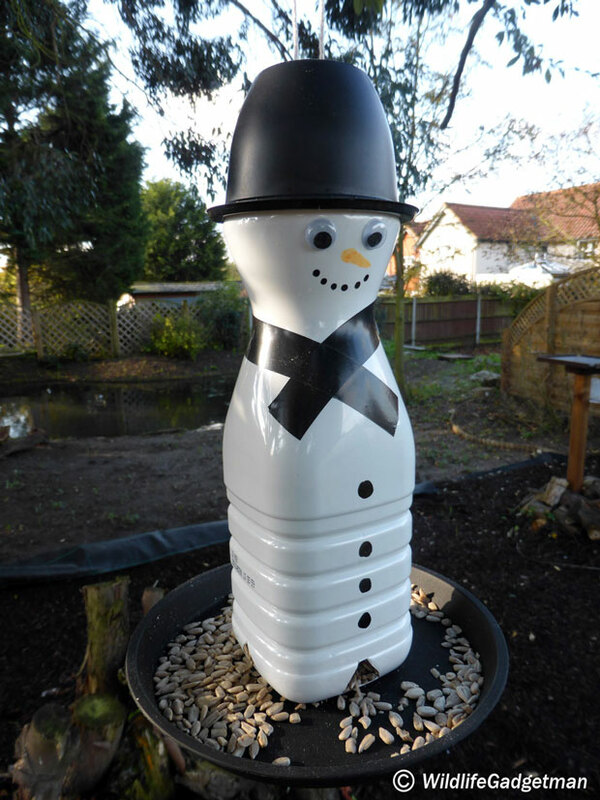 I’ve designed this fun snowman feeder using a recycled Cravendale milk bottle. A great project to do with the kids! 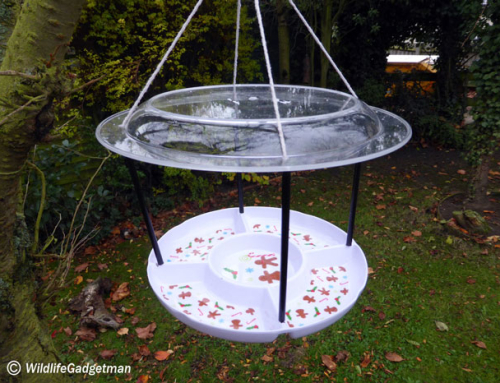 There are three key items you need to make the snowman feeder. First the bottle for the main body. I chose a Cravendale milk bottle as it has a great snowman…ish shape and its white plastic rather than translucent. The second key item is the black snowman hat. I used a plastic tub from a Tesco microwaveable chocolate pudding (yum!). 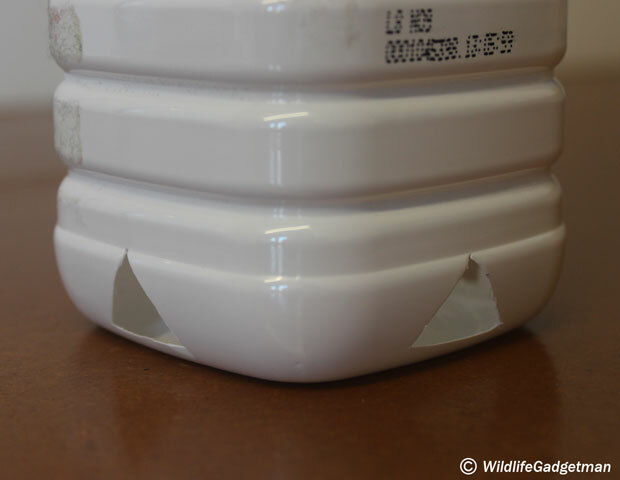 They come in packs of two and are the ideal diameter to sit nicely on top of the milk bottle. The final key item is a plastic plant pot drip tray. I always have a few of these laying around as I’m always coming up with new ways to use them! I pick them up from the local discount store for 50p each. To create my inky paint mixture I used non-toxic black powder paint and a small amount of vegetable oil. 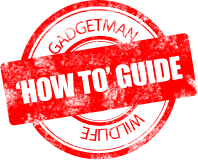 Add just enough oil to the powder paint to give you a single cream consistency when mixed. The oil prevents the paint from drying out and will last several days. 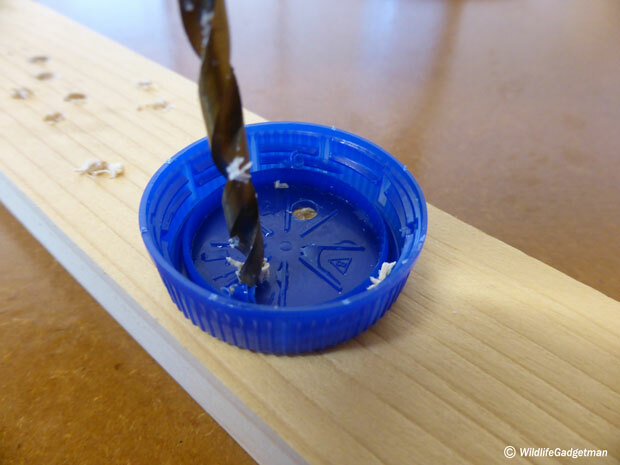 Drill two 4mm diameter holes in the base of the bottle as in the image above. 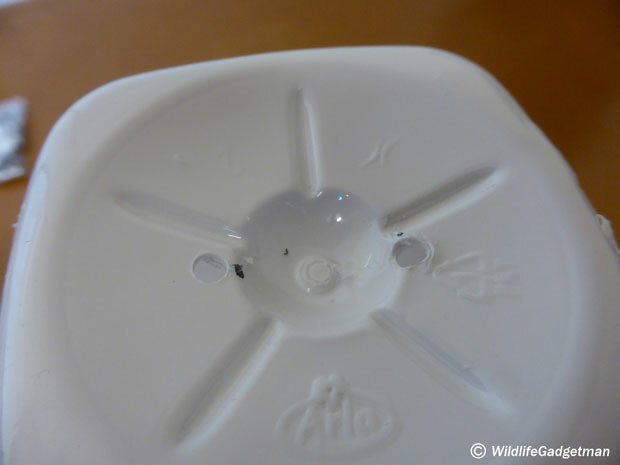 Drill two similar holes in the centre of the plastic plant pot drip tray too. 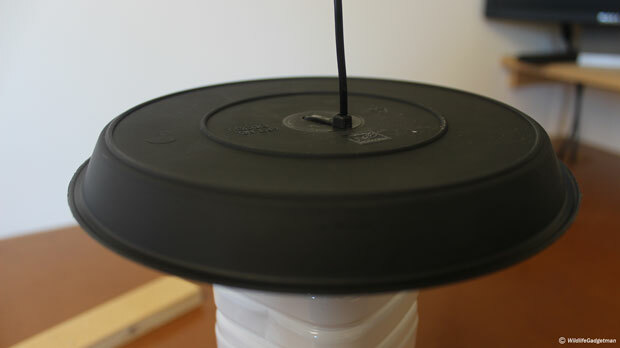 Attach the drip/seed tray to the base of the bottle using a cable tie as in the image above. 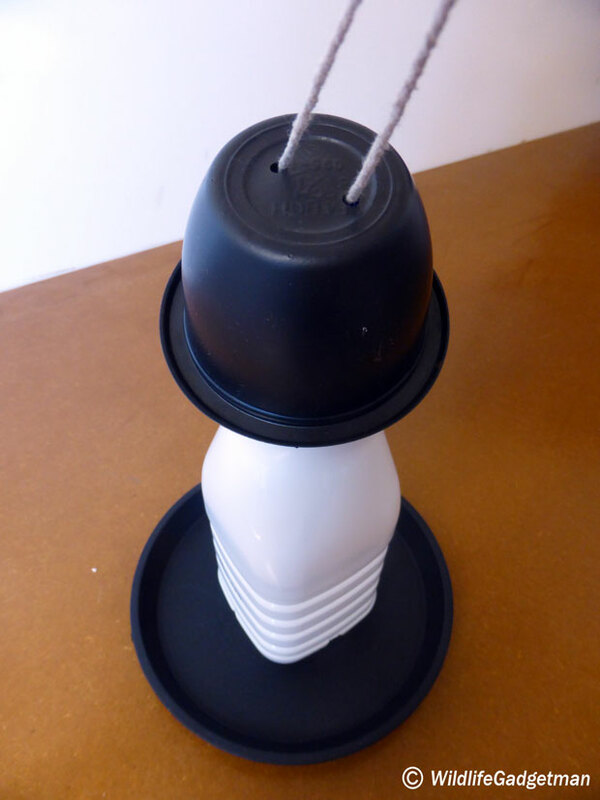 Drill three or four extra holes randomly around the base of the tray for drainage. 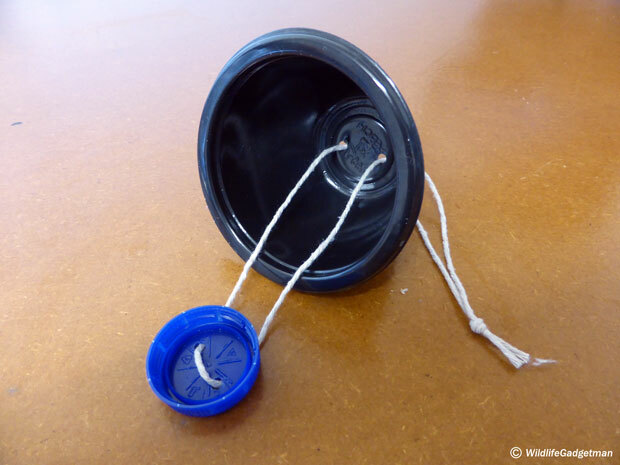 Drill two holes in the bottle cap in preparation for creating the hanging loop. Drill two similar holes in the base of the small pudding tub. 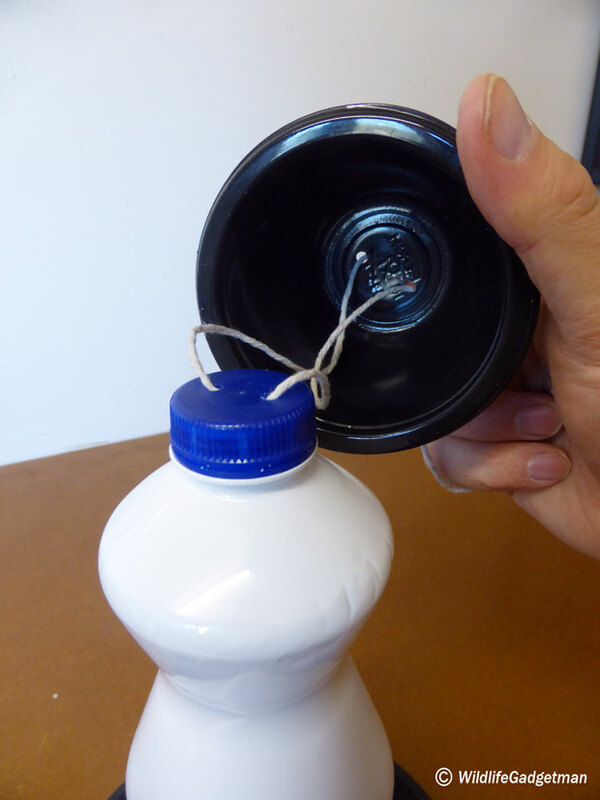 Attach the plastic bottle cap and the pudding tub hat together using a loop of string. Screw the cap back onto the bottle and ensure that the hat sits nicely in position. 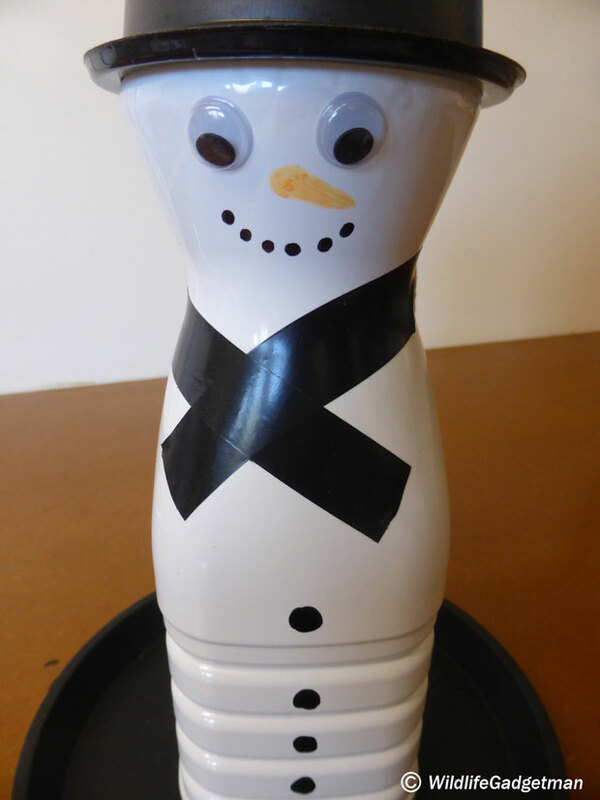 You should now have a blank snowman feeder ready for decorating. Get creative and start decorating! Now this is the really fun part! Start adding your snowman features. You can be as creative as you like. I’ve used a couple of stick on googly eyes, some black insulating tape for the snowman’s scarf and permanent marker pens to draw the rest of the features. 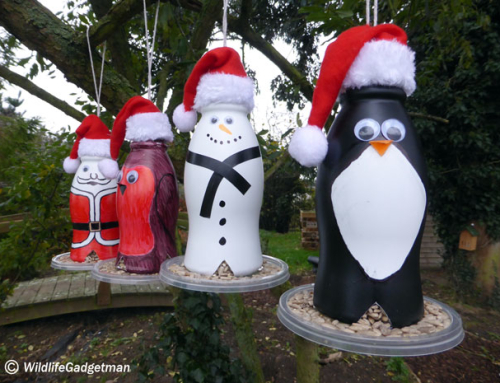 Hang your new snowman bird feeder in the garden! 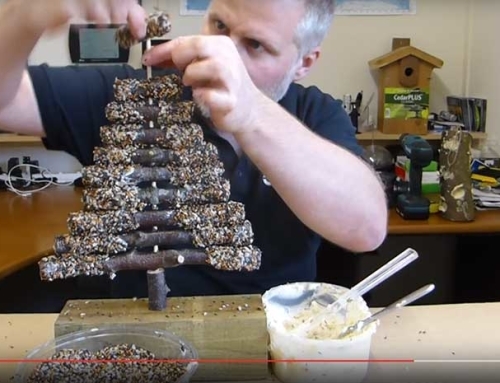 Once you’ve finished decorating your snowman feeder all that’s left to do is fill it with bird seed and hang it in the garden! 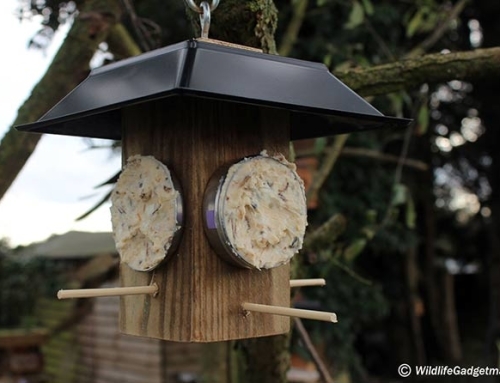 I hope you enjoy making my latest bird feeder creation! Feel free to send me photos of your snowman feeders too via Twitter of Facebook. I’d love to see them! Have fun!